When we were in Pennsylvania, Amber served us baked oatmeal for breakfast. She’d mixed it up the evening before, after we’d cleaned up from the birthday dinner, stirring together oats and sugar, milk and eggs. She divided the batter between two pans and then grabbed a bag of blueberries from the freezer and, sprinkling out a generous amount, covered the tops of the cakes completely. The she slipped the pans into the cold oven and set it for delayed bake. I was fascinated. The batter didn’t sour overnight? Would the blueberries sink in? What else did she use her delay bake for? Did the oven turn off automatically? Had she ever burned anything? And so on. 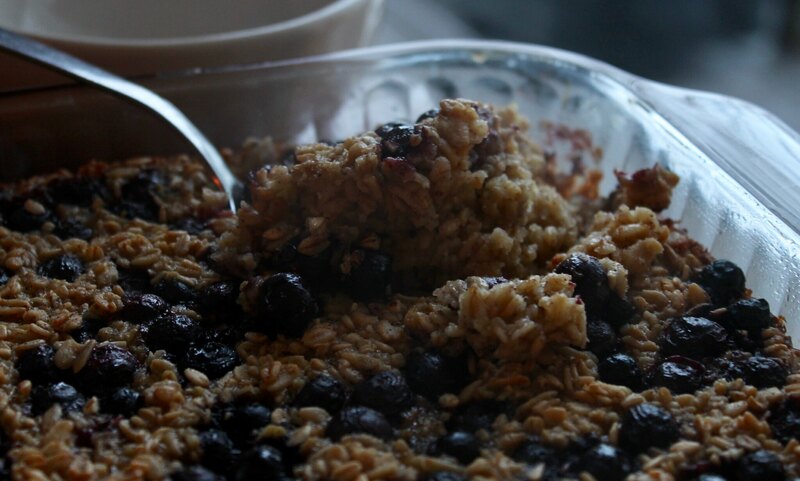 The baked oatmeals were delicious. Their overnight rest had softened and plumped the oats, and the cakes baked up high, the blueberries capping the cake with juicy sweetness. Back home, my husband and I studied the oven manual, trying to figure out the fancy settings. We first set the clock and then the delay bake, and then we stood there, waiting for the oven to whoosh on at the appointed time — I certainly didn’t want to burn the house down while we slept. Satisfied that all was in working order, I mixed up a batch of Amber’s baked oatmeal and popped it in the oven. The next morning, I was still in bed when I heard the oven peep that it was at temperature. Soon after, the smell of baking oats wafted up the stairs. By the time I walked into the kitchen, breakfast was five minutes from being done. While similar to my standard recipe, Amber’s is a little less sweet and more cake-like, thanks to the overnight soak. In my recipe — a fast mix-and-bake affair — the oats rise to the top a little, leaving a thin custardy layer of buttery egg on the bottom. I liked that sweet layer, but the children did not. Amber’s recipe, now, they much prefered. "It's way better, Mom," my older son said. "Way better." Also, delay bake is awesome and I love my oven. 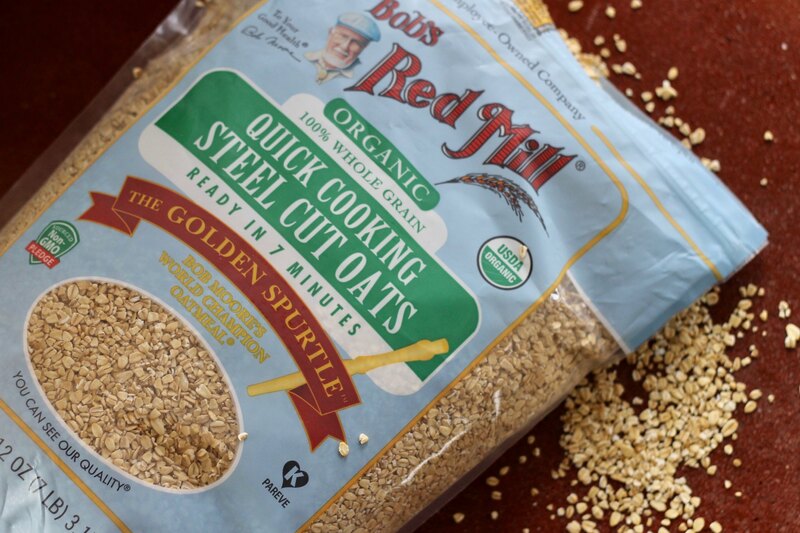 The first time I made this, I used rolled oats, but then I discovered a sack of quick cooking steel cut oats — they looked very similar to Amber's hand-rolled oats — and snatched them right up. It's funny though — Amber fusses about her hand-rolled oats. She thinks they make her granola and baked oatmeal too chewy. But the chewiness is exactly what we love! Do what you want: For a more nubbly, nutty baked oatmeal, use the Costco fancy cut oats, or regular rolled oats, and for a cakier baked oatmeal, use quick oats. Either way, it will be delicious. Amber uses a scale to measure her oil — just plops the mixing bowl on the scales, tares it, and then glug-glugs in the oil — so she doesn’t have to dirty a measuring cup. 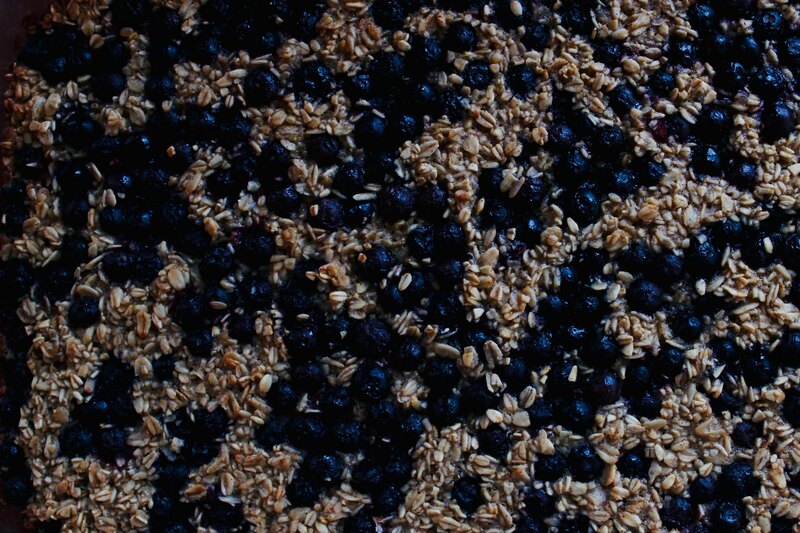 Stir together the dry ingredients and mix in the wet (except for the blueberries). Pour the batter into a buttered 9x12-inch pan. Sprinkle the blueberries on top — I lightly stirred them into the top layer of batter, but Amber did not. Let the pan sit on the counter, or in a cold oven, at room temperature overnight. In the morning, bake for 30 minutes (40 minutes, if using delay bake) at 350 degrees. This same time, years previous: a new routine, the quotidian (1.23.17), and so it begins, hobo beans, rocks in my granola and other tales, polenta and greens, chuck roast braised in red wine. I adore my timed/delay bake!!! I use it at least once a week - most recently when I was running a late afternoon errand and I wanted the potatoes to start baking for supper. I also adore mixing up breakfast the night before and doing what Amber does (also love her blueberry technique - will try that next time). I call this the "night kitchen" method and you can do it with any baked good that uses double-acting baking powder. I've done muffins, coffee cakes, and baked oatmeal. . . and it's soooooo luxurious to smell breakfast when I get out of bed, almost like I have a cook or my mom out in my kitchen making the morning smell good. . . But, I recently bought a Zojirushi rice cooker and I can load it with steel cut oats the night before and set the time I want it to finish and they are waiting piping hot and ready to eat when we come down in the morning. Aldi has steel cut oats so that is my easy place to pick them up. 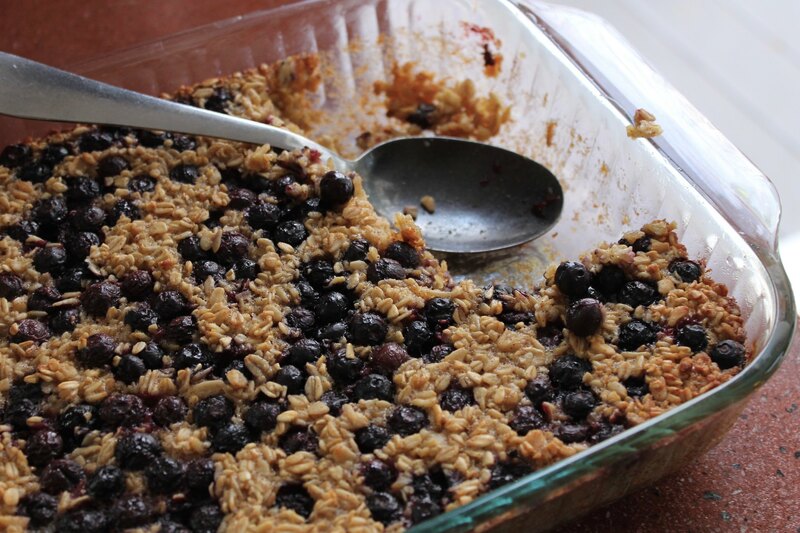 I've made baked oatmeal for years! We love it. My recipe is from a friend who got it from an Amish family years ago.....it's very similar to this one!